In a large bowl, whisk the vinegar, mustard, and shallot. Slowly whisk in the EVOO; season the dressing with salt and pepper. 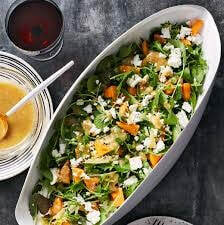 Add the greens, persimmons, and feta to the bowl; season the salad. Toss to coat.